After the events of the Long Night, Daenerys Targaryen finds herself in a changed world. She is surrounded by new allies but also by new enemies. She must rely on those she can trust but also in herself and those who love her. First and foremost I wanted to express my undying gratitude to Alice (@aliciutza) for agreeing to be my beta reading. She's been an amazing editor and had really helped me bring this story, which I've been sitting on for almost two years, to life. You will never know how truly grateful I am to you. Love you Alice! <3. This is my first multi-chapter fic and I am really working on improving my writing and storytelling skills. I would welcome your critics and suggestions for improvement. All I ask is that you be honest but respectful. I'm think-shinned so I won't be hurt if you don't like something. A piercing light shattered the fog in her mind, her closed eyes struggling against the brilliant rays. What could be so bright, she wondered. It was much too bright to be a torch. Dany took a deep breath to clear her mind; the air tasted sweet; it was cold and dry, burning the back of her throat. She felt the wind howling all around her; its freezing bite stung her cheeks. Far away she heard the faint cries of a small child, but how could that be? Who was crying? It sounded like a babe. She turned her head slightly to the right, but a sharp pain ran down her back, stopping her from moving any further. She had to open her eyes and search for the babe. In this frigid cold, it would freeze to death. Dany couldn’t remember where she was; she began to feel warm. Her body ached all over, and there was a burning pain between her legs. Once again, she heard the cries of a babe. She began to take long deep breaths, trying to muster all her energy. She took another deep breath, and with all her might she summoned the strength to finally open one eye and then the other, only to be blinded by a dazzling light — so intense it could only come from the sun. The sun! When was the last time she had seen the sun? Dany could not remember. The sun which had hidden itself for more than a year had finally found its way home, up above in the sky. Dany groaned as she gently turned towards the source of the crying; which had not come from far at all, but right next to her. There, cradled in the crook of her left arm and wrapped in furs, was a babe. Whose babe was this? She thought as she closed her eyes and racked her brain trying to remember. The ache between her legs pulsed and Dany remembered. It was her babe! Of course, thought Dany, how could she have forgotten. The pains in her body suddenly felt duller, and even as the cold raged outside she felt a fire light inside of her and smiled. With a strength she did not have a moment ago, she sat up and cradled the babe between her arms rocking her gently. “My babe, my beautiful little girl.” She said as she placed a gentle kiss upon her child’s forehead. She set her babe down on her lap and looked at her full-on for the first time in daylight. Her little girl was so beautiful: she had Jon’s dark hair and her own amethyst eyes – they were large and curious – her nose was small, and she had the sweetest pouty lips. Her cheeks were rosy from the cold. She was truly something to behold, thought Dany, still smiling and hugging her to her chest. Opening her fur coat, Dany lifted her shirt enough to slide her daughter onto her breast so that she could eat. It was a sweet pain to feel, to finally have a living babe suckling upon her breast. The babe suckled eagerly, clearly hungry and happy to finally have her meal. Dany looked towards her left and saw Jon lying there next to her, asleep with Ghost at his side. In the excitement of being with her daughter, she hadn’t even noticed him. She began to shake Jon, "Jon! Jon, wake up!" She said as she shook him, but he was not responding. Something wasn't right; the warmth she had felt a moment ago started to seep out of her, and a cold dread began to rise inside instead. Why wasn’t he waking up, why wasn’t he moving? “No,” the word came out barely a whisper. Dany’s hands clenched into fists as she tried to cover her mouth – while a cry of anguish made its way up her throat. Tears began to spill freely from her eyes, warm against her cold cheeks. She hugged her babe closer to her and began to rock with her whole body back and forth. She clenched her jaw to keep the screams that were threatening to come up. She wanted to throw up, but there was nothing in her stomach. Finally, unable to stop herself she began to scream his name. "Jon!" “Please, wake up, Jon!” she moaned, but he was immobile, cold… gone. She began to pray to the old gods and the new, hoping one of them would hear her pleas. But alas, there was no one to hear her and Jon remained there next to her, cold and quiet. An agony unlike anything she had ever felt erupted like a volcano, leaving a crater where her heart resided. From her lips burst a cry in a voice she barely recognized as her own. Her daughter began to cry again, her cries matching Dany’s own. She rocked her babe gently once again singing her a lullaby she had heard while living in Tyrosh. The child finally calmed herself and latched onto her mother’s breast once again and continued to feed. Dany began searching all around her, looking for somebody, anybody who could help. But all she saw was a winter wasteland. It was flat all around her, far in the distance she could see snow covered mountains and to the other side, the great Wall of Westeros. Trees were scattered throughout, cold and lifeless. She had to squint against the brightness of the snow on the ground; she looked up, the sun looked far away, its warmth barely reaching her. She was surrounded by a vast emptiness; fitting she thought, it matched the void inside of her. A gust of cold wind blew in her face, and she suddenly recalled her dragons. My children she thought, what had happened to them? She closed her eyes and touched her temple trying to remember where they were. They were gone, she knew, as surely as she knew Jon was gone. Her children, the only children she thought she’d have. She had called herself their mother, and to them she was. But alas, like everything else, they were gone as well. The thought of them just brought more pain and emptiness. She raked her brain, forcing the fog that had settled there to move aside and show her the truth. There had been a great fire; she could see it now. Viserion, Rhaegal, and Drogon had perished in it. Poor Viserion, the Night’s King had stolen him but, in the end, he returned to his mother, he remembered who she was. A sweet moment that had turned bitter when the great fire had turned her dragons back to stone — a strange and fitting end. Now, they stood as statutes in what used to be the heart of winter. The raging wind had finally died down allowing her a reprieve from its frosty touch. But the reprieve only served to remind her of her pain, winter had been a ruthless enemy. It had not been satisfied with taking her dragons; it had also taken Jon too. A small cry left her throat and tears began to spill once again. Her daughter had fallen asleep in her arms, so Dany gave in to her sorrow. “Why?” she cried “Why did you have to take him away too? It’s not fair.” She continued to cry quietly losing herself in her pain. Her breath started to come in quick and shallow bursts and she began to panic. How was she going to survive this without Jon? What was she going to do? How was she going to hunt? She had no answers for these, but she knew she could not give into despair. After a while, she found herself staring mindlessly at the landscape around her, finally settling on a pair of red eyes that had been staring at her the whole time. “Ghost,” she said surprised and slightly embarrassed that she had forgotten him in her despair. 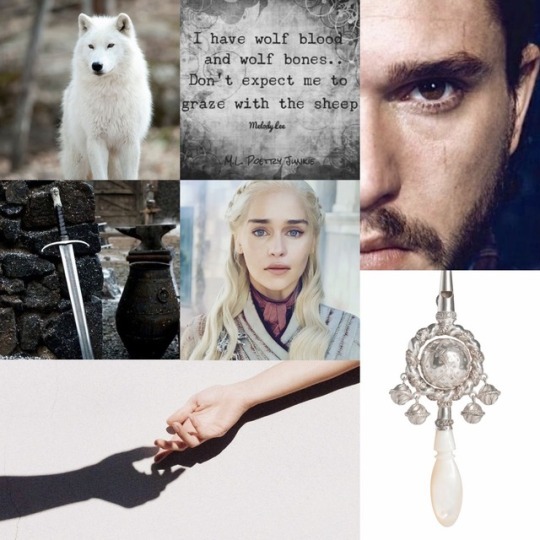 She got up to walk towards him as he slowly inched towards her until they stood face to face; he was taller than Dany, but not by much, she barely had to look up to meet his eyes. Dany laid her forehead upon his and began to caress him gently. “Oh, Ghost, what are we going to do?” she took a step back and looked upon his bright red eyes once again. Jon used to say that he was of the old gods with his fur as white as the bark of a Weirwood tree and eyes as red as its leaves. As she continued to look into his eyes, she noticed how intently Ghost looked at her. Dany could imagine he understood her grief; after all, he too had lost Jon. She looked away for a moment to try and regain her composure, but Ghost just stood there staring at her. Her mind began to race, trying to find an answer. But deep down she already knew what had happened. She closed her eyes and took a deep breath; this time she smelled the blood. She must have bled out and died, thought Dany horrified. But how could she be alive now? It was impossible, there was just too much blood. Had Jon given her the kiss Melisandre had once given him? It was the only explanation Dany could think of. Why did you give your life for mine? Oh, Jon, why? But as her child stirred, she had her answer; if she died, their child would die too. Jon would never let his child die, not if there was a way to save them both. And now she was here in the middle of nowhere, alone save for her babe and a wolf. She lamented once again. How much more would they take from me? Had they not taken enough already? They had her mother, her brothers, her son, Rhaego, and her beloved dragons. It wasn't fair! Dany thought bitterly. But she had learned that lesson long ago. The gods were as fickle as any man had ever been. Dany turned towards where the fire had been. Jon had taught her many things on the journey there and how to light a fire was one of them. Once lit, Dany laid down next to Jon's frozen body to settle for the night. The tears had come flowing freely then, unstoppable like a waterfall after a storm, and just as quickly as they fell, they froze upon her cheeks. She had cried herself to sleep. Her daughter had cried too, but her tears had been from hunger not the pain of loss. The sorrow Dany felt was so deep that she could not see an end to it. She hoped her daughter would never know such pain. The next morning, she awoke cold and stiff, she had only managed to sleep a few hours. Her head was pounding, and her bones ached. Dany knew she could not stay where she was much longer; she had to make her way back to Eastwatch and from there to Winterfell. However long it took her, her daughter needed her to be strong, even when she felt like she could barely breathe. She began to collect dried frozen twigs and arranged them around Jon, the Long Night might be over, but she could not take her chances, her daughter depended on her. Ghost had helped her, picking them up in his mouth and dropping them next to the body of the man that had once been his master. She wondered what Ghost could be thinking, how sad this must be for him. Dany could barely stand to look at Jon’s dead body, but she made herself do it anyway. These would be the last moments she would lay eyes on him; the last time she would be next to the man she loved. I have no more tears to shed; she thought as she stared at his handsome face. “I will never be loved by you again.” She turned around and continued her grim task. When she had gathered enough twigs, Dany set her daughter on the ground, making sure to cover her well, she would have to think of a name for her, but that would have to wait. It took her a few tries as her hands were shaking uncontrollably, she couldn’t make a spark. She leaned back on her haunches and took a deep breath and tried again. Finally, she got the fire going, and after a few minutes it took hold of Jon’s clothes and began to grow until it engulfed him in flames. Dany grabbed Jon’s sword Longclaw, she looked at it thinking how she thought of it almost like an extension of him, after a moment she placed it across her back then she gathered her daughter into her arms and tucked her underneath her furs. As she stared into the pyre, she thought back to the other pyre she had set for a man she had thought she loved, in what seemed like a lifetime ago. She had risen from the ashes of that pyre with her dragons and her people who followed her across the vast Red Sea. Now, she stood in this vast sea of snow, but instead of three dragons she only had one — that was worth a million dragons; she was worth everything. She had gained something far more valuable than anything she’d ever had. Dany looked down at the little one stirring around, searching for her next meal, and she smiled. Perhaps the gods had taken so much from her because that was the prize she had to pay for her babe. As Dany stared one last time at the fire that slowly consumed Jon’s body, she felt a wet nuzzling on her neck; she turned to her side to see Ghost looking at her with such sadness, that had she not had already cried all her tears, she would have begun to cry again. “Don’t worry. We have survived far worse, but at least we are still together." She said caressing the fur on his neck. There was nothing to be done, she thought, and all her tears and all her sorrow would not get her any closer to Winterfell or get her daughter to a warm and safe place. It would not be an easy journey; they had walked far past the Wall in search of the tree the Children of the Forest had used the create the first Other. Now, she would have to make her way back, alone save for her daughter and the white wolf that had once been Jon’s. She swallowed deeply before she turned around one last time to stare at Jon’s pyre “We can’t be with each other as we once were, but I believe we’ll be together again, in the starry sky or wherever dragons go when they die.” With that, she turned around with her daughter in her arms and her great white wolf in tow and made her way to salvation.